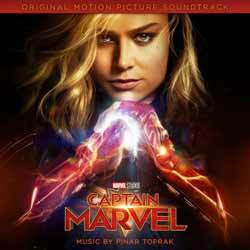 Pinar Toprak (Justice League, Krypton, The Lightkeepers, The Wind Gods) delivers exactly what you'll be expecting with her score for Captain Marvel. The album contains 23 tracks (1 hr, 07 min, 27 sec) and is packed to bursting with epic, adrenaline charged action themes. For those who have seen the movie, you'll already be aware of the fact that the score is instrumental in creating the right vibe, and acts as another character in its own right. It's big, it's bold, but there's also a subtle, layered element. However, there's also nothing here that stands out as memorable. Yes, it's epic and in your face, but I doubt anyone left the cinema humming the theme tune, even though it's a good, solid action theme. This is more a multi-layered offering that rewards the listener over time. While, as a whole, I thoroughly enjoyed this score, there wasn't a single track that I felt the urge to add to my current playlist.